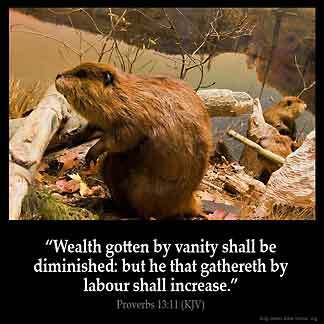 PROVERBS 13:11 KJV "Wealth [gotten] by vanity shall be diminished: but he that gathereth by labour shall increase." 8The ransom of a man's life are his riches: but the poor heareth not rebuke. 9The light of the righteous rejoiceth: but the lamp of the wicked shall be put out. 10Only by pride cometh contention: but with the well advised is wisdom. 11Wealth gotten by vanity shall be diminished: but he that gathereth by labour shall increase. 12Hope deferred maketh the heart sick: but when the desire cometh, it is a tree of life. 13Whoso despiseth the word shall be destroyed: but he that feareth the commandment shall be rewarded. 14The law of the wise is a fountain of life, to depart from the snares of death. Wealth gotten by vanitie shall be diminished: but he that gathereth by labour, shall increase. Wealth gotten by vanity shall be diminished; But he that gathereth by labor shall have increase. Wealth quickly got will become less; but he who gets a store by the work of his hands will have it increased. Wealth gotten by vanity shall be diminished: but he that gathereth by labor shall increase. Wealth gained dishonestly dwindles away, but he who gathers by hand makes it grow. Wealth from vanity becometh little, And whoso is gathering by the hand becometh great. Wealth gotten by vanity shall be diminished; but he that gathereth little by little shall increase. 13:11 Vanity - By wicked practices. Let that be so. Amen. The love of money is the root of all evil : Money is not evil , the love of it is. He that hasteth to get rich, especially be deceit shall fall and come to poverty . He that is diligent and having the Lord : The word of God directing his way shall come to riches ; not only in money but in health and in mental stability and spiritual strength. Praise God and you can also add Peace. An undisturbed state of being and restful nights of sleep. Amen !!!! That is tantamount to abundant wealth fraudulently acquired but believe me it never lasts and can never be put to good use.